Back in the eighties, I took a seat at the bar in a London pub. This was before pubs got all tricked out with pendant lights and scrummy snacks. Smoke was thick, beer was warm, and wine was for tossers. I was stymied on a drink choice, but the barman sussed it out and pulled a pint of hard cider from a tap hidden among the bitters and lagers. Lightly chilled, apple juicy but dry, lovely little sparkle. Mind: blown. May I have some more, please? Cider. Yum. And still surprisingly underappreciated. Despite a craze that’s seen cider drinkers increase from 6 to 18 million in the US since 2012, the sale of hard cider in bars and restaurants is still just a tiny fraction of beer sales. In Virginia, on-premise sales compared to beer are twice the national average, but miniscule nonetheless at just 3%. As a lower-alcohol, gluten-free beverage crafted for a wide variety of palates, cider is deserving of your attention. Especially this month, as we move into firepit and roast pork season. Here’s how to get more Virginia cider into your life. Cheers, mates. Cider Week runs from November 10th to the 19th. Tastings, tours, and tap takeovers are happening all over Virginia. Pick a couple events and harvest a bushel of new experiences. See Cider Week events ideas at ciderweekva.com/events. A dozen craft cidermakers are within easy driving distance of Northern Virginia, including two in the Shenandoah Valley. The Winery at Kindred Pointe (3575 Conicville Rd, Mt. Jackson; kindredpointe.com) offers a traditional cider line with varying degrees of sweetness, plus several infused with flavors of ginger or hops. At Old Hill Cider nearby (17768 Honeyville Rd, Timberville; oldhillcider.com), you can outfit your Thanksgiving dessert tray with a bottle of “Season’s Finish,” an ice-style dessert cider that pairs beautifully with a final course of dried fruits and nuts and stinky cheese. Ciders available in the tasting rooms. (Old Hills Cider also ships – contact them directly to order). Virginia’s hard ciders are almost all small-scale productions using local apples. Old Hill Cider gets fruit from its family-owned Showalter Orchards, which has been in business 50 years. Albemarle CiderWorks, near Charlottesville, specializes in growing apples that thrive in Albemarle County. 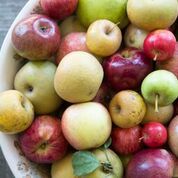 Foggy Ridge grows cider apples you’d never snack on; ones with high-acid and high-tannin lend more complexity than the ubiquitous McIntosh and Gala. At these cideries, each bottle comes from an orchard, not a large-producer apple juice concentrate stripped of color, aroma and oftentimes, sadly, even flavor. Cobbler Mountain Cellars (5909 Long Fall Ln, Delaplane; cobblermountain.com) – Red Delicious rules here, with added flavors of maple syrup, oranges, honey, hops, blackberries and more. Corcoran Vineyards and Cider (14635 Corky’s Farm Ln, Waterford;corcorancider.com) – With ciders ranging from off-dry to seriously sweet, there’s something for everyone. These two are a little farther afield, but Cider pilgrims won’t want to miss out. Bold Rock Cider (1020 Rockfish Valley Hwy, Nellysford; boldrock.com) – In just a half dozen years, two smart guys grew a local cidery into the largest independent cider producer in the U.S. Beautiful venue for tastings. 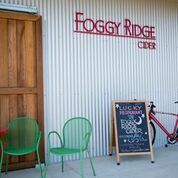 Foggy Ridge Cider (1328 State Rd 656, Dugspur; foggyridgecider.com) – Owner Diane Flynt has been nominated for James Beard Awards three times for her commitment to artisanal cider, nurturing the return of many heritage apples, and tirelessly promoting Virginia’s cider industry. Cider vs. Juice: What’s the Difference? Hard Cider is apple juice that has gone through fermentation, during which its sugars turn into alcohol. Sweet Cider is the murky juice often sold at farmer’s markets and fall produce stands. It is pure apple juice that often hasn’t been filtered, preserved, or pasteurized (thought that’s getting more difficult to find, due to health concerns). Lose it in the back of the fridge and you may unearth a bottle bloated by natural fermentation. Some happily drink it; others put their trust in Google’s advice. Apple Juice is the clarified juice pressed from apples and sold on grocery store shelves. The juice will have been filtered and pasteurized.